La Revista Andaluza de Medicina del Deporte (RAMD) es la Publicación Oficial del Centro Andaluz de Medicina del Deporte, órgano dependiente de la Consejería Turismo y Deporte de la Junta de Andalucía. La RAMD es una publicación trimestral, Open Access, que no requiere pago por parte del autor ni por el envío del manuscrito ni por su publicación y en la que en caso de aceptación, el autor cede los derechos. Los artículos disponibles de forma inmediata tras su publicación están sujetos a la licencia CC-BY-NC-ND. Constituye un foro multidisciplinar para investigadores, especialistas en Medicina de la Educación Física y el Deporte y para los diversos profesionales, cuyas actividades están relacionadas con la actividad física, el deporte y la salud. Debido a la naturaleza multidisciplinar de esta área del conocimiento, la RAMD cubre diferentes disciplinas relacionadas con la Medicina del Deporte, lo que la convierte en una publicación de alto valor para todos los profesionales relacionados con la Medicina y las Ciencias del Deporte. Publica artículos científicos Originales, Revisiones, Casos Clínicos y artículos especiales en español, inglés y portugués. The Andalusian Journal of Sports Medicine (Revista Andaluza de Medicina del Deporte, RAMD) is the Official Publication of the Andalusian Center of Sports Medicine, which is under The Ministry of Tourism and Sports of the Government of Andalusia. RAMD is a quarterly publication and is open access, requiring no payment by the author, either for submitting the manuscript or for its publication. Should the manuscript be accepted, the author cedes the rights to the manuscript. Articles available immediately after their publication are subject to the CC-BY-NC-ND license. RAMD is a multidisciplinary forum for researchers, specialists in physical education and sports medicine and the various professionals whose activities are related to physical activity, sports and health. Due to the multidisciplinary nature of this knowledge area, RAMD covers various disciplines related to sports medicine, making it a valuable publication for all professionals involved in sports medicine and science. RAMD publishes original scientific articles, reviews, cases studies and special articles in Spanish, English and Portuguese. a Department of Nutrition. University of Mogi das Cruzes. Mogi das Cruzes, SP. Brazil. b Group of Study and Research in Neuromuscular System and Exercise (GEPESINE). CEFE. State University of Londrina (UEL). PR, Brazil. Group of Study and Research in Integrative Biology of Exercise (GEPEBIEX). Department of Physical Education. CCS. Federal University of Rio Grande do Norte (UFRN), RN. Brazil. c Faculty of Physical Education. Federal University of Mato Grosso (UFMT), MT. Brazil. d Faculty of Physical Education. State University of Campinas (UNICAMP). Campinas, SP. Brazil. e Department of Physical Education. Catholic University of Brasilia (UCB). Brasilia, DF. Brazil. f Center of Metabolism in Exercise and Nutrition (CeMENutri). School of Medicine. Paulista State University (UNESP). Botucatu, SP. Brazil. Objectives. To evaluate the effects of pre-exercise high concentration carbohydrate supplementation on performance, cardiovascular, metabolic and hormonal responses during high intensity cycling exercise. Method. Seven male cyclists (28.7 ± 5.4 years; 65.2 ± 4.7 kg body weight), who performed two continuous exercise trials under placebo (PLA) or carbohydrate (CHO) ingestion at a work rate of 80% VO2max until exhaustion, participated in the study. The cyclists received 5 ml.kg-1 of a maltodextrin solution diluted at a concentration of 10% (CHO) or placebo (PLA) at 60, 45 and 30 min pre-exercise. Results. A 5.4% reduction in the time to exhaustion was observed in the CHO trial compared to the PLA trial. In both trials, glucose and lactate levels were higher in the post-trial condition compared to pre-exercise values (p < 0.05). 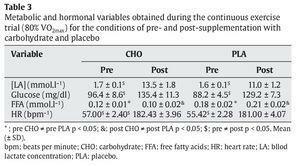 Free fatty acid levels were lower in the CHO group than in the PLA group both before and after the trial (p < 0.05). Insulinemia was higher during the pre-trial in the CHO group (42.7 ± 3.6 μU.ml-1) compared to the PLA condition (11.8 ± 3.3 μU.ml-1) (p < 0.05), and even decreased to 23.8 ± 5.1 μU.ml-1 during exercise after CHO intake (p < 0.05). No significant differences in plasma cortisol were observed between the two trials (p > 0.05). Conclusions. Pre-exercise high concentration CHO supplementation resulted in impaired performance in high intensity cycling exercise and decreased free fatty acid levels. Objetivos. Evaluar los efectos de la suplementación pre-ejercicio de hidratos de carbono de alta concentración en el rendimiento y respuestas cardiovasculares, metabólicas y hormonales durante el ejercicio de alta intensidad en bicicleta. Método. Participaron en el estudio siete ciclistas varones (28,7 ± 5,4 años; 65,2 ± 4,7 kg de peso corporal), que realizaron dos ensayos con placebo (PLA) e hidratos de carbono (CHO), con ejercicio continuo en un ritmo de trabajo del 80% del VO2máx, hasta el agotamiento. Los ciclistas recibieron 5 ml.kg-1 de una solución diluida de maltodextrina en una concentración de 10% (CHO) o placebo (PLA) a los 60, 45 y 30 minutos antes del ejercicio. Resultados. Se observó una reducción de 5,4% en el tiempo hasta el agotamiento en el ensayo de CHO en comparación con el grupo PLA. En ambos ensayos, la glucosa y los niveles de lactato fueron mayores en el estado posterior al ejercicio en comparación con los valores previos (p < 0,05). Los niveles de ácidos grasos libres fueron menores en el grupo CHO que en el grupo PLA tanto antes como después del ejercicio (p < 0,05). La insulinemia fue mayor en la condición pre-ejercicio en el grupo CHO (42,7 ± 3,6 μU.ml-1) en comparación con el grupo PLA (11,8 ± 3,3 μU.ml-1) (p < 0,05), y disminuyó hacia 23,8 ± 5,1 μU.ml-1 durante el ejercicio, después de la ingesta de CHO (p < 0,05). No hubo diferencias significativas en el cortisol plasmático entre los dos ensayos (p > 0,05). Conclusiones. La suplementación pre-ejercicio con CHO de alta concentración resulta en un menor rendimiento en ejercicio de alta intensidad en bicicleta y en una disminución de los niveles de ácidos grasos libres. In contrast to the consistently observed beneficial effect of the ingestion of carbohydrates (CHO) during low-intensity exercise1, the efficacy of pre-exercise CHO ingestion is unclear, especially in the case of high-intensity exercise such as some athletic competitions, cycling and various types of weight lifting2-7. Some studies have demonstrated that CHO ingestion before exercise may result in hyperglycemia and hyperinsulynemia8, which is followed by a rapid decline in blood glucose at the beginning of exercise, often referred to as rebound hypoglycemia3,7. This hypoglycemic effect resulting in impaired performance has been reported by Keller and Schwarzkopf9 and Foster et al10, but no changes in performance were observed in most studies6,7,11-13. Beneficial effects on performance have only been reported in some studies14-16. Most studies investigating pre-exercise CHO supplementation have used concentrations ranging from 5 to 18%2,4,17,18. High CHO concentrations promote CHO absorption, which is good for fuel supplementation. However, high concentrations may impair the gastric emptying rate and intestinal water absorption1. In contrast, low concentrations benefit fluid absorption but may not supply sufficient energy to meet the needs of working muscles during exercise19,20. According to Jacobs and Sherman21 and Tsintzas and Williams22, pre-exercise CHO ingestion can exert a beneficial effect during intense exercise since muscle glycogen stores are the first substrates utilized during maximum exercise, a fact contributing to a reduction of these stores within short periods of time. Data in the literature regarding the importance of pre-exercise CHO ingestion are controversial, particularly on high-intensity short-duration exercise20, since most studies published so far have evaluated prolonged exercise. Additionally, there is a lack of studies seeking to investigate the impact of the ingestion of a high concentration of CHO in this type of exercise, which makes relevant this study. In addition, we believe that investigations of this nature may contribute to better understand the effects of such supplementation with the purpose to potentiate the performance of athletes of different modalities. Therefore, the objective of the present study was to analyze the effects of acute supplementation with CHO at a concentration of 10% on performance and cardiorespiratory, metabolic and hormonal responses during high intensity continuous exercise in cyclists. Seven male cyclists (28.7 ± 5.3 years, 65.2 ± 4.7 kg, 169.1 ± 6.2 cm) belonging to the road (n = 2) and mountain biking (n = 5) categories volunteered to participate in this study. The subjects had a mean competitive experience of 6.17 ± 4.7 years and participated in state and national competitions. Before the beginning of the study, each participant responded to a questionnaire in which they reported the absence of smoking, alcohol abuse, and use of anabolic steroids or any type of supplementation, as well as the absence of a history of metabolic disorders. All subjects received detailed information about the study proposal and procedures to which they would be submitted and signed a free informed consent form. This study was approved by the local Institutional Research Ethics Committee. Initially, anthropometric measures were performed to characterize the sample as well as a pilot test aimed to familiarize the subjects to the test protocol and the equipments. Later, the volunteers arrived at the laboratory at 8:00 am and were submitted to an incremental test for the determination of maximal oxygen consumption (VO2max) and the individual anaerobic threshold (IAT). First, the subjects performed a 3-minutes warm-up on a cycle ergometer at a load of 50 W. Next, the incremental test was initiated with a load increase of 50 W at intervals of 3-minutes, maintaining a pedaling frequency of 60 to 70 rpm until voluntary exhaustion. VO2max was calculated when the VO2 plateau was reached with increasing exercise intensity according to the following criteria: a) increase in VO2 of less than 2 ml.kg-1.min-1 for an increase of 5-10% in exercise intensity; b) respiratory exchange ratio (RER) > 1.1, and c) maximal heart rate predicted for age. 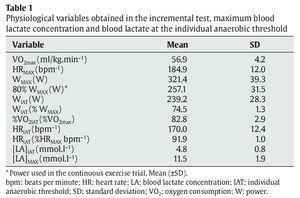 Lactate concentration was measured for the determination of IAT. For this purpose, 25 μl arterial blood was collected at baseline (pre-exercise), during the final 20 seconds of each stage until exhaustion, and at 3, 5 and 10 minutes after the end of the trial. The IAT was calculated according to the method of Stegmann et al23. Heart rate was measured at rest and during the test over the final seconds of each stage. All subjects were submitted to two continuous exercise trials on a cycle ergometer under supplementation with CHO or PLA (aspartame). Supplementation with CHO or PLA was performed using a randomized double-blind design. The subjects received 15 ml.kg-1.h-1 of CHO solution (100% maltodextrin) diluted at a concentration of 10% or of PLA, both grape flavored. The CHO or PLA solution was ingested orally in fractionated portions over a period of 60 minutes preceding the beginning of each trial (pre-exercise), with 5 ml.kg-1 being ingested at 60, 45 and 30 minutes, respectively. The trials were performed on different days at an interval of 72 hours between tests, always at the same time of day (9:00 am). The trials were performed at a power (W) of 80%, corresponding to VO2max determined in the incremental test. First, VO2 was measured at rest for 3 minutes, with the mean of this period being adopted as the resting oxygen consumption (VO2R). Next, the subjects warmed up for 5 minutes at a load of 100 W. After warm-up, the continuous exercise trial was initiated, with the subjects maintaining a pedaling frequency of 70 to 80 rpm until voluntary exhaustion. Heart rate was measured at rest and at the end of the trial for both conditions. In the present study, all trials were performed on an electromagnetic cycle ergometer (Corival 400, Quinton®, USA). Respiratory parameters were measured continuously with an open-circuit spirometric system (QMCTM 90 Metabolic Cart, Quinton®, Bothell, USA) using the breath-by-breath technique. After each trial, the gas analyzer was calibrated using a 3-L Hans Rudolf 5530 calibration syringe and a mixture of 5% CO2 and 95% N2. The data were processed in an IBM computer by the calculation of minute ventilation (VE), VO2, carbon dioxide production (CO2), and the ratio between carbon dioxide production and oxygen consumption (RER). Heart rate was measured by telemetry using a heart rate monitor (Vantage NV, Polar®, Kempele, Finland). The room temperature and relative air humidity were maintained at 21 to 24 °C and 40 to 60%, respectively. The subjects were asked not to use sedatives, not to smoke and not to ingest alcoholic beverages or products containing caffeine on the days preceding each trial to prevent any interference. The subjects were also instructed not to perform any type of physical exercise during the 48 hours preceding the trials, and to communicate any change in their health status that occurred during the 24 hours preceding the experiment. A diet corresponding to the dietary habits of each subject was elaborated (3,172.50 kcal; 67.5% CHO, 18.6% fat and 13.9% protein). The subjects were instructed to follow this diet throughout the experimental period. On the day of the trials the subjects arrived at the laboratory after an overnight fast and consumed a standard breakfast (415.0 kcal; 68.5% CHO, 18.5% fat and 13.4% protein) 2 hours before the exercise test. Data regarding the quantity and quality of the ingested foods were processed using the Virtual Nutri software, version 1.0. Venous blood (5 ml) was collected from a peripheral vessel in the right forearm into a vacutainer before warm-up and immediately after the continuous exercise trial (80% VO2max). The samples were centrifuged at 3,000 rpm for 15 minutes at 4 °C and plasma was stored in a freezer at -70 °C for subsequent determination of plasma concentrations of free fatty acids (FFA), glucose, insulin and cortisol. FFA were determined by the method of Regouw et al24 and samples were read in a spectrophotometer (UV-VIS®, Shimadzu Mini 1240, Japan). Plasma glucose was assayed by an enzymatic colorimetric method (Bio Diagnostica) in an RA-XT apparatus (Technicon Co., USA). Plasma insulin was measured by radioimmunoassay (Gamma 5500B, Beckman Co., Germany) and plasma cortisol was determined by chemiluminescence (Immunolite 2.0, USA). For the determination of blood lactate concentration, 25 μl of arterial blood was collected from the ear lobe into a heparinized capillary tube at the same time as the venous samples. Blood lactate concentration was determined with an electrochemical analyzer (YSL 2300 STAT, Yellow Spring Co., USA). The results were analyzed using the StatisticaTM for Windows 6.0® (Statsoft Inc., USA) package. 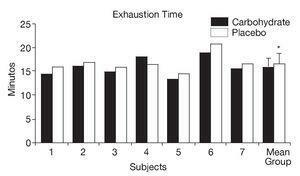 First, it was calculated the power of the sample based in the time of exhaustion pre-exercise. The statistic power of the sample was 80%. The time to exhaustion in the continuous exercise trial was compared between the CHO and PLA groups by the Wilcoxon test. Possible differences in VE, VO2, RER, heart rate, FFA, lactate, glucose, insulin and cortisol obtained at the different times of the study (pre- and post-supplementation with CHO and PLA) were analyzed by analysis of variance for repeated measures (Friedman test). The level of significance was set at p < 0.05. The physiological variables of the subjects obtained in the incremental test are shown in table 1. As shown in figure 1, athletes supplemented with CHO presented a significant reduction in the mean time to exhaustion in the continuous exercise trial (CHO: 15.82 ± 1.99 minutes, PLA: 16.72 ± 1.98 minutes, p < 0.05). Fig. 1. Individual and mean (± SD) time to exhaustion in the continuous exercise trial (80% VO2max) after supplementation with carbohydrate and placebo. *Significant difference (p < 0.05). The RER was significantly higher in the CHO group (0.95 ± 0.01 and 1.19 ± 0.01, pre- and post-trial, p < 0.05, respectively) than in the PLA group. In addition, all cardiorespiratory variables were significantly higher after the trial when compared to pre-trial values (table 2). FFA levels were significantly lower in the CHO group compared to the PLA group both before and after the trial (pre: 0.12 ± 0.01 vs 0.18 ± 0.02 mmol.l-1 and post: 0.10 ± 0.02 vs 0.21 ± 0.02 mmol.l-1, p < 0.05, respectively) (table 3). A significant reduction of insulin was observed in the CHO trial after exercise (23.8 ± 5.1 μU.ml-1) when compared to the pre-trial condition (42.7 ± 3.6 μU.ml-1) (p < 0.05). The opposite was observed in the PLA trial (pre: 11.8 ± 3.3 and post: 17.7 ± 4.9 μU.ml-1, p < 0.05). Pre-trial insulin concentration was significantly higher in the CHO group (42.7 ± 3.6 μU.ml-1) than in the PLA group (11.8 ± 3.3 μU.ml-1) (p < 0.05) (table 3). With respect to plasma cortisol concentration, no significant differences were observed between both groups (p > 0.05). In the present study, we investigated the effects of pre-exercise high concentration carbohydrate supplementation on the performance and cardiovascular, metabolic and hormonal responses of cyclists before and after a high-intensity short-duration exercise protocol. The exercise sessions were performed at a high intensity, a fact that can be confirmed by the heart rate, VE, VO2 and lactate responses. No ergogenic effect on the performance of the participants was observed after pre-exercise CHO supplementation (~98 g) at a concentration of 10%. The performance (time to exhaustion) was reduced by 0.9 minutes (5.4 ± 0.51%) compared to PLA. Unlike our findings, Bonen et al6 and Koivisto et al7 investigated the impact of pre-exercise CHO supplementation (1.5 g/kg and 1.0 g/kg, respectively) at a concentration of 20% and 30%, on the cycling performance in a short duration, high intensity continuous exercise protocol (80% VO2max), and found no significant changes in performance, although they observed higher time-to-exhaustion values in the placebo condition (~10%). The authors suggested that this decrease in performance after CHO ingestion could be related with hyperglycemia and hyperinsulynemia, which is followed by a rapid decline in blood glucose at the beginning of exercise, often referred to as rebound hypoglycemia. In contrast, an opposite effect was reported by Millard-Stafford et al25, who showed a significant increase of 17 and 14 seconds in 1.6-km performance runs with 8% (80 g) and 6% (60 g) CHO drinks, respectively, when 1 liter of the CHO drink was ingested 60 minutes before exercise, followed by ad libitum ingestion during exercise as compared to a water-only trial. In the present study, after exercise, the glycemic response was higher compared to the pre-exercise condition and no significant difference was observed between the CHO and PLA trials. The observation of these elevated glucose levels after exercise also in the PLA trial (~68%) was probably due to a marked increase in hepatic glycogenolysis stimulated by the higher concentration of catecholamines and cortisol which increase proportionally with exercise intensity2,26. According to Davis et al18 and Tsintzas and Williams22, the rate of catecholamine release also increases with increasing intensity, with the liver releasing more glucose in relation to the amount taken up by active muscles. This increase of glucose levels in the PLA trial possibly resulted in an increase of plasma insulin concentration, a response also reported in the recent study of de Sousa et al2, emphasizing the particularity of high-intensity exercise. Particularly for this group, it should be emphasized that both the diet ingested on the day before the trials (~535 g CHO) and the breakfast consumed before the beginning of the exercise protocol (~71 g) may have increased muscle and hepatic glycogen stores in these athletes. The present findings demonstrate that CHO ingestion before exercise (~98 g/10%) resulting in a ~30 μU/ml increase of plasma insulin concentration (~3.7 times higher compared to the PLA trial), reduced fat free acids (~47%), a fact that may contributed to the increase of the RER in the CHO trial. RER during cycling were significantly higher during CHO than PLA, suggesting a greater CHO utilization. Similar findings have been reported by Febbraio et al11, Cramp et al27, Horowitz et al28 and Hargreaves et al29. Furthermore, in the present study insulin concentration was found to be reduced during exercise, a response similar to that observed for continuous long-duration exercise. According to Hayashi et al30, muscle contraction during exercise stimulates AMPK, particularly its α2 isoform, inducing the translocation of GLUT-4 to the plasma membrane and increasing glucose uptake. This activity of skeletal muscle α2-AMPK was 3- to 4-fold higher immediately after high-intensity exercise (75% VO2max for 60 minutes), whereas no activation was observed after low-intensity exercise (50% VO2max for 90 minutes). 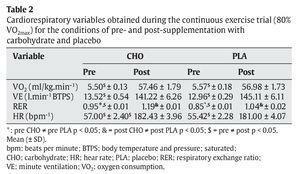 In view of the above considerations, the reduced FFA concentration and increased RER observed for pre-exercise CHO supplementation may indicate a higher rate of CHO oxidation. Although we did not determine the muscle glycogen content of the cyclists, the use of CHO supplementation as an exogenous energy source probably resulted in a lower utilization of muscle glycogen stores, a finding also observed by Jentjens and Jeukendrup5 and Jeukendrup et al19. Therefore, the present results cannot be extrapolated to all situations. On the basis of the present results, we conclude that pre-exercise high concentration CHO supplementation impaired the performance of cyclists by 5.4 ± 0.51% and probably reduced muscle glycogen depletion (glycogenolysis), but did not attenuate the cortisol or heart rate response. Further studies focusing on the use of exogenous glucose are necessary to evaluate the effect of CHO supplementation during short-duration (less than 60 minutes), high-intensity exercise that imitates the demands of many competitive sports in terms of performance and metabolic and hormonal responses. The authors thank the Fundação ARAUCÁRIA, FAPESP, the CNPq and the CAPES, for graduate and post-graduate scholarships. DEF. State University of Londrina (UEL). Rodovia Celso Garcia Cid. Pr 445 km 380, Cx. Postal 6001. CEP 86051-990, Londrina, PR, Brazil. American Dietetic Association, Dietitians of Canada, American College of Sports Medicine, Rodriguez NR, Di Marco NM, Langley S..
American College of Sports Medicine position stand. Nutrition and athletic performance..
De Sousa MV, Simões HG, Oshiiwa M, Rogero MM, Tirapegui.. Effects of acute carbohydrate supplementation during sessions oh high intensity-intermittent exercise..
Seifert JG, Paul GL, Eddy DE, Murray R..
Glycemic and insulinemic response to pre-exercise carbohydrate feedings..
Morris JG, Nevill ME, Thompson D, Collie J, Williams C.. The influence of a 6.5% carbohydrate-electrolyte solution on performance of prolonged intermittent high-intensity running at 30 °C.. Prevalence of hypoglycemia following pre-exercise carbohydrate ingestion is not accompanied by higher insulin sensitivity..
Bonen A, Malcolm SA, Kilgour RD, MacIntyre KP, Belcastro AN..
Glucose ingestion before and during intense exercise..
Koivisto VA, Karonen SL, Nikkila EA..
Carbohydrate ingestion before exercise: comparison of glucose, fructose, and sweet placebo..
O''Reilly J, Wong SH, Chen Y..
Glycaemic index, glycaemic load and exercise performance..
Pre-execise snacks may decrease exercise performance..
Foster C, Costill DL, Fink WJ.. Effects of pre-exercise feedings on endurance performance..
Febbraio MA, Chiu A, Angus DJ, Arkinstall MJ, Hawley JA.. Effects of carbohydrate ingestion before and during exercise on glucose kinetics and performance..
Sparks MJ, Selig SS, Febbraio MA..
Pre-exercise carbohydrate ingestion: effect of the glycemic index on endurance exercise performance..
Decombaz J, Sartori D, Arnaud MJ, Thelin AL, Schurch P, Howald H..
Oxidation and metabolic effects of fructose or glucose ingested before exercise.. Speedy D, Kelly M, O''Brien M.. The effect of pre-exercise feeding on endurance exercise performance..
Sherman WM, Peden MC, Wright DA..
Carbohydrate feedings 1 hour before exercise improves cycling performance..
Thomas DE, Brotherhood JR, Brand JC..
Carbohydrate feeding before exercise: effect of glycemic index..
Millard-Stafford M, Rosskopf LB, Snow TK, Hinson BT..
Water versus carbohydrate-electrolyte ingestion before and during a 15 km run in the heat..
Davis JM, Jackson DA, Bradwell MS, Queary JL, Lambert CL..
Carbohydrate drinks delay fatigue during intermittent, high-intensity cycling in active men and women..
Jeukendrup AE, Wagenmakers AJ, Stegen JH, Gijsen AP, Brouns F, Saris WH..
Carbohydrate ingestion can completely suppress endogenous glucose production during exercise.. The effectiveness of commercially available sports drinks.. The efficacy of carbohydrate supplementation and chronic high-carbohydrate diets for improving endurance performance..
Human muscle glycogen metabolism during exercise..
Stegmann H, Kindermann W, Schnabel A..
Lactate kinetics and individual anaerobic threshold..
Regouw BJ, Cornelissen PJ, Helder RA, Spijkers JB, Weeber YM.. Specific etermination of free fatty acid in plasma..
Millard-Stafford M, Rosskopf L, Snow T, Hinson B..
Intense exercise has unique effects on both insulin release and its roles in glucoregulation..
Cramp T, Broad E, Martin D, Meyer BJ.. Effects of preexercise carbohydrate ingestion on mountain bike performance..
Horowitz J, Jeffrey F, Mora-Rodrigues RO, Byerley L, Coyle E..
Lypolitic suppression following carbohydrate ingestion limits fat oxidation during exercise..
Effect of carbohydrate ingestion on exercise metabolism..
Hayashi Y, Nagasaka S, Takahashi N, Kusaka I, Ishibashi S, Numao S, et al.. Single bout of exercise at higher intensity enhances glucose effectiveness in sedentary men..